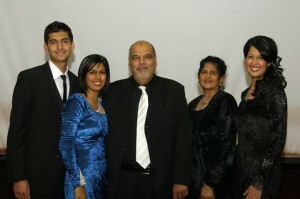 From left: Shaah, Farzeen, Akbar(dad), Shireen(mom) and Saffiyah. When it comes to setting your children on the road to success, Professor Akbar Bootha of North-West University (NWU) and his wife Shireen, a retired teacher, are experts in the field. All three of their children – Saffiyah, Farzeen and Shaah – graduated from the NWU B.Com Accounting programme and are in the final stages of qualification as Chartered Accountants South Africa [CAs(SA)] at PriceWaterhouseCoopers. Qualifying as a CA(SA) has become a key to opening doors to a vast selection of lucrative careers. The knowledge and insight attained in a CA(SA) qualification has seen this qualification become the most admired business qualification in South Africa. Careers as strategists or analysts, leadership roles such as CEO, CFO or COO, and traditional accounting and auditing roles beckon. But the path of any successful CA(SA) starts at home. Parents must be aware of the correct choices when planning the long term goals of their child’s education. Teachers and schools in South Africa are under great pressure to produce high pass rates. This pressure, according to many experts, creates a situation where most school children opt to drop core mathematics – leaving them unqualified to follow their chosen careers, and leaving the country woefully short of skills. With a current shortfall of around 5000 CAs(SA) across the country, a career in accounting is a wonderful opportunity – but the right choices must be made along the way. The South African Institute of Chartered Accountants (SAICA) works tirelessly through its Thuthuka Bursary Fund (TBF) to promote the value of a good education in mathematics, particularly in the more rural areas where bright and talented students often find themselves without adequate guidance or funding. However, it is in the home that parents, even those without education, should become aware of what subjects their children must focus on in order to lay the foundations for a successful career. Once the parents and the school have played their parts, the TBF strives to create an environment which caters for all of a student’s needs once they arrive at university. The TBF is a unique fund for accounting students who are in the CA(SA) stream. It covers tuition, books, meals, res fees and accommodation. Students also receive an allowance, to build the social and professional networks so important to their careers. They also learn to give back: TBF students are obliged to go back to their schools, convince the next generation of learners to take core mathematics and to excel. Third and fourth year TBF students also double as coaches and mentors for those in their first and second years.